When you create a Suddenlink username, you can set up and access email, view your bill, enroll in EZ Pay, watch TV on the go with Suddenlink2GO and more. If you already have a username, but don’t remember it or the password, click here. Otherwise, follow the below instructions. 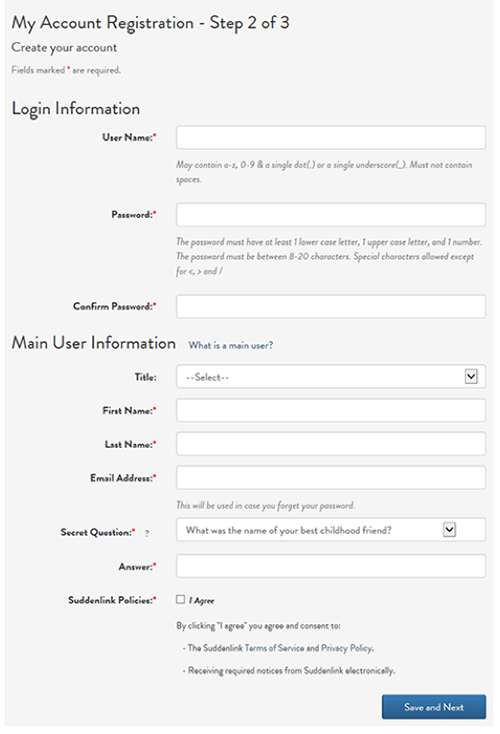 To create your primary username, go here or click "Sign Up Now" from any sign-in page. Enter your 16-digit account number (without dashes) and 4-digit PIN found on your bill or order confirmation email. Complete the required fields as shown below and select "Save and Next". Choose whether or not to enroll in paperless billing and select "Finish Registration".